Full Credits to Glen Carman for writing this post. Fats and oils are an important components to cooking, the terms in their simplest form is, fat is solid at room temperature (lard is a good example) and oils are liquid at room temperature (olive oil being a good example) today these terms can be abused, the popular coconut oil being a good example, although they are now chemically modifying it to be liquid at room temperature, by its strict definition, most coconut oil sold is a fat not an oil, but this piece is not to split hairs about our modern products, but to be informative about the historical uses and availability. Our fats and oils we use for cooking come from either animals where the fats are removed from the fatty tissue (tallow and lard) or is used as removed from the animal (fatback and suet) or when plant based they are removed from pressing the seed or in the case of olive oil, by the pressing of the fruit. One use of fats in cooking is of course the process we call frying, the fats/oils in this process serve two purposes, one is that the fats/oils can be heated to between 350F-450F before starting to break down (this is called the smoke point and at this point the oils start to release the volatile substances and carbonize). This cooks the food faster than surrounding it with water when cooking (boiling/poaching), it helps partly seal the food and helps prevent it from drying out like a dry heat will do, especially at these temperatures, it adds flavor to the foods and also helps prevent it from sticking to the pan. The other big use for fats/oils in cooking is as a shortening in bread/pastry products (the term shortening also is used for a vegetable product similar to lard called vegetable shortening) what the fats/oils do is shorten the gluten strands, this makes a softer, more crumbly product, and it also helps keep the crust from becoming heavy. Breads can be made with out shortening, a good example is the types we often call French/Italian breads, which are tougher and crustier than the breads with some shortening in the product. Different fats/oils will word different that another, I will cover a bit on this as we go on, but till you get experienced with how they work it’s best to follow the recipe and use what it calls for, we have a much wider variety of fats/oils available for our use, but the historical ones worked in the past, they will work just as well for our historic as well as modern recipes. The most common animal fat used was from swine and in most cases was rendered into lard or sometime the fat strip along the top of the spine was removed and cut into strips and used for larding/barding of lean meats such as game, to introduce fat into the meat in the cooking process to make it more juicy and tender. The fat back (and in some cases side/belly meat) was either laid on top while cooking or was put under the skin of fowl or even inserted into cuts in the meat. Fat back and belly/side meat was often salted to help preserve it and of course side/belly meat was also often smoked and made into bacon, this method is often used today with bacon which also introduces some of the cured bacon flavor into the meat. If this is undesirable, un-smoked and even un-salted fat back and side/belly meat can be found with a little searching, small town butcher shops that do custom butchering are your best bet, most large groceries buy wholesale vacuum packed cuts, but they still may be able to order what you want. Lard was the most used fat for cooking in 19th century America, lard from fat of swine, and the fat is removed from the tissue with heat, called rendering or trying out. Bacon and sausage drippings that have been saved and allowed to harden are really just lard with some salt and the other flavors of the product they were saved from after cooking; these can be used in place of lard in most cooking if the flavor of the meat is desired although less salt may be needed. Today lard made by the major packers is made from all the fat scraps of the butchered hog, but in the past the fat from the abdominal cavity was rendered separately and is known as leaf lard. This was used as a superior shortening to the regular lard from the meat itself and was highly prized by bakers, especially for making pie crusts and other pastries and breads. When the different types were rendered separately the lard from the meat itself was used more often for frying foods and the leaf lard for baking. Leaf lard can sometimes be found at places that do custom butchering, or the fat can be bought from them to render into leaf lard. Suet and tallow refer to fats from beef, suet meaning the untendered fat, tallow meaning the fat that has been rendered. Suet was more commonly used in cooking than tallow; tallow was often used when lard was scarce, suet was often used in pudding, and mince pies as well as other baking applications, the suet for cooking most often coming from the abdominal cavity, this being the highest quality. Other animal fats used sometimes included the rendered fats from chickens, ducks and geese. Some of this was of necessity, some of this was because of ethnical back grounds, and often these included but were not limited to Eastern European dishes. To render fat one just needs a few simple things, a large pot, something to stir with and something to strain the leftover tissue out of the melted fat as well as the fat of the desired animal with as much meat removed as possible. Rendering fats is not limited to just bovines and swine, any animal fat can be rendered although lard and to a lesser extent, tallow are with the exception of poultry, the ones desired for cooking. Deer, bison and sheep fat have living history uses along with other animals in recreating history, in the era before kerosene, most lamps used whale oil because it stays liquid at lower temperatures, but skunk, badger and other animals were used when whale oil or kerosene was scarce or too expensive. Stir often to keep from scorching and as you get melted fat in the bottom the heat can be turned up slowly to speed the process up. When you have most of it melted the heat can be turned up and the extra heat will get rid of the water and render the last of the fat out of the tissue, it is important to get it hot enough to get rid of the water which will turn the lard or tallow rancid in time, but not hot enough to smoke which would break down the fats. A temperature of about 250F is desired, one can use a thermometer if desired. After the fat is rendered, it is best to let it cool to about 150F before straining, for safety reasons, I strain mine through several layers of cheese cloth and store it in canning jars. As I try to emphasize safety, I should mention that rendering needs monitored so that it does not get to hot and start a very dangerous fire, if that happens having some sort of lid to place on top will put the fire out although a Class C type fire extinguisher is not a bad idea to have handy to use if the lid fails. When rendering lard, the leftover cooked tissue is called cracklings and can be saved to use in crackling cornbread, a favorite period recipe made by simply adding them to the mix before baking. Butter is an animal based fat that is made from agitating cream (churning) skimmed from the whole milk, most butter used in the United States is made from cream obtained from cow milk. Butter can be used for frying or as shortening in cooking just like other fats/oils. Butter is a water/oil emulsion made from the butter fat in cream; the proteins in it are the emulsifier. Butter when kept cold is a solid, at room temperature it is soft making it spreadable, at temperatures in the lower to middle 90’s it liquefies, the exact temperature depending on it’s exact composition. Butter is used as a shortening in baking, as a spread or condiment and for frying. Butter can range in color from a medium yellow to almost white, depending on the diet of the cows, today and even in the 19th Century most butter is dyed with vegetable dye to give it that pale yellow color that most people think butter should be. Butter is made by churning cream, this is best defined as simply shaking it up, and this separates most of the liquid from the butter fat. The early butter churns were simply a wooden barrel with a plunger or dasher that was moved up and down in the barrel by hand, the familiar butter churn of the pioneers often seen in text books. Into the 19th century better means of churning were developed using paddles similar to the Dover type hand egg beaters. These ranged in size from small ones cranked by hand that held a quart or more of cream to large industrial ones using some sort of mechanical power to turn them. One can also churn small amounts of butter by putting the cream in a jar about half full, then putting a lid on it and shaking it till the butter forms. When butter was made as a farm industry on a small scale it was often molded in a variety of different sizes and shapes of molds, these were often used to distinguish who had made the butter by the size and shape of the mold. 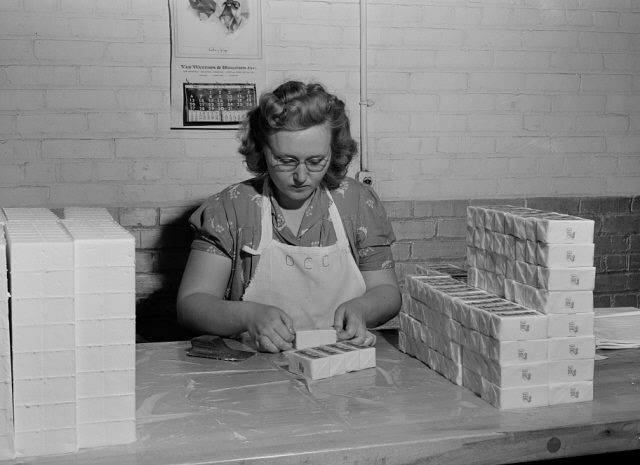 When the Co-Op Creameries started making more and more of our butter on a mass scale, most of it was made up in one pound cubes of a rectangle shape and were wrapped in waxed or oiled paper with the name of the creamery printed on the wrapper. Today most of the butter we buy at the grocery store is in ¼ pound sticks and four of these sticks are packed in the pasteboard boxes most butter is sold in are the same size and shape as the one pound blocks, which are also still available and to be as period as you can, it should be purchased this way. The modern sticks have lines on the paper; by cutting on the lines it is easy to measure the amount of butter. By the turn of the century, half or more of the butter made in the United States was made in factories rather than being a farm made product. When buying butter you will see terms used to describe the butter, in this country you will see in most cases Sweet Cream Butter or in rare cases, Cultured Butter. Sweet cream butter is made from butter that has not soured by the action of lactic bacteria; cultured butter is made from cream that has soured by the action of bacteria. Back in the days before the Co-Op creameries and wide spread pasteurization, most of the butter was cultured, the milk from several milkings were saved up to churn at once, also the butter separates easier with cultured cream. The larger amounts of cream at the creameries needing churned more often, pasteurization, refrigeration as well as mechanical powered churns made the milder tasting sweet cream butter the more popular type in America. Butter is also marked on the package either Salted or Unsalted, The salted has salt added to preserve it, and it will stay fresher longer than unsalted. The choice is best left up to the individual, one needs to remember if the recipe calls for unsalted and salted butter is used them it is best to either reduce the salt used of to leave it out all together. Unsalted butter is best if it is used up fairly quickly although if one gets a good deal on some it will keep for many months in the freezer. Butter is also grade the Grade AA and Grade A are the ones most often seen in stores, Grade B through D are more for industrial use such as large bakeries. Grad AA is made from the freshest and sweetest creams and when found commands a higher price, and the “sell by” dates are shorter on it. Grade A is the most common seen in grocery stores, the quality of both are very good and to be honest most people can not tell the differences so when buying butter let your own taste be the guide to which one. Butter made and sold in the United States will have a fat content of about 80%, the rest being solids whey, water and butter milk not fully removed in the churning process, for use as a table condiment, or shortening, this is not a problem, how ever for frying, the butter can be improved, by clarifying, this is the process of removing all but the butter fat. Regular butter has a smoke point of 350F and although this is fine for low temperature frying/sautéing, by clarifying it the smoke temperature can be raised to 450F. Clarified butter can be made easily by melting the butter and letting it cool back to a solid. The different densities separate and stay separated upon cooling. The remaining whey will form a skin on top which is removed and the water and the solids will settle to the bottom. The fat is removed by pouring it off the water and solids before it cools and turns solid again, the water and solids being less dense that the butter fat, they sink to the bottom. Clarified butter also has the advantage in that there is less of a chance of it turning rancid than un-clarified butter. (The Asian product Ghee, is similar, but uses a different process, but not likely to have been encountered much in 19th century America.) Clarified butter was often sealed in tin cans and shipped to areas where fresh butter was scarce, one will see accounts of butter being shipped to California during the Gold Rush from back east, this was actually clarified butters sealed in tins, and the regular product would not have made it around the Horn un-spoiled. Many plants contain edible oils in their fruits or seeds, today in the United States a large part of the fats and oils that foods are fried in or are added to foods as shortening come from plants. 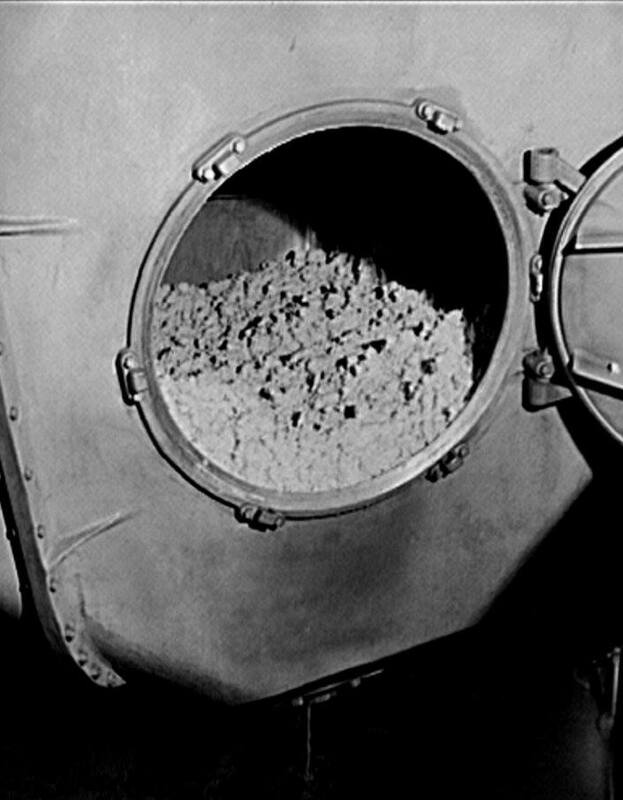 Most of these had little or no importance in the United States during the 19th Century, although some were used in other parts of the world, Soy Bean Oil use dating back hundreds of years in China and to the mid 19th Century in Europe, Sunflower oil dating to the late 17th or early 18th Century in Russia. 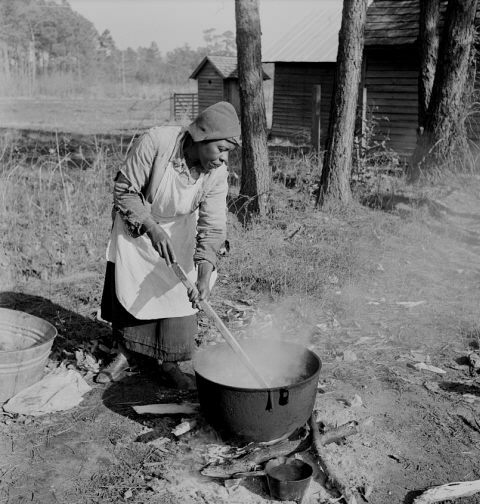 Peanut oil was made mostly on farms for their own use in the areas that grew peanuts; commercial production did not begin till about the time of WWI on any kind of a large scale commercial production began, partly due to the lard shortages during WWI. 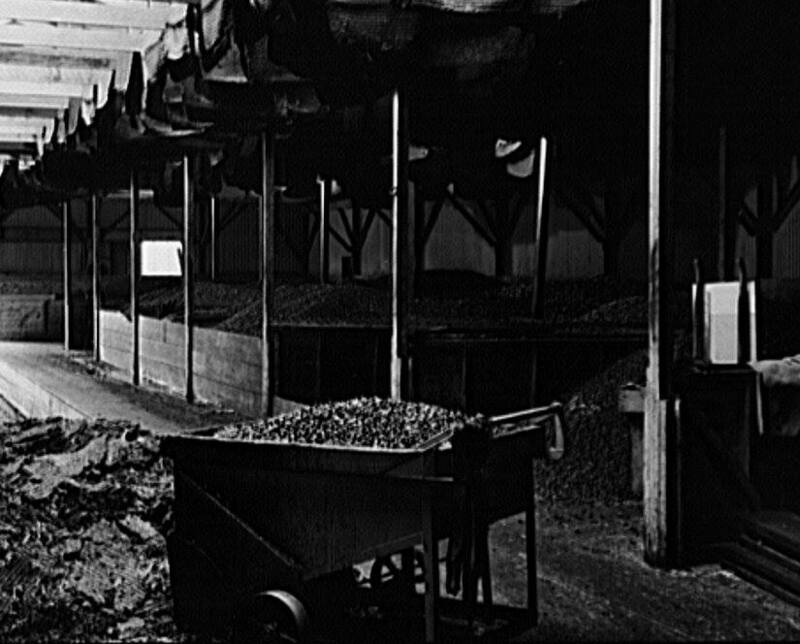 (This is also about the same time peanuts became a large scale crop, thanks to George Washington Carver and others, before that it was mainly small scale for snacks and livestock feed.) Corn Oil and Cotton Seed oil was bottled and sold for cooking uses starting in the early 1880’s for cotton seed oil and the late 1880’s for corn oil. Coconut oil and Safflower Oil were imported in small quantities as well as Walnut Oil, made from the English/Persian walnuts, these mostly being used as salad oils because of the costs. This is a term used in a lot of period cook books, it is simply a high quality oil used for making oil and vinegar or other dressings, olive oil being the most used but walnut and safflower oil were popular, perhaps as much to do with price as taste, something more expensive wins out sometimes over a better similar product. These are imitation products, the margarine of course being a substitute (fake) butter and the vegetable shortening being the same except it a substitute for lard. Those of us with some better knowledge know that the Emperor Napoleon offered a large prize to who ever could develop a cheaper substitute for butter to feed his troops and the poor people in his realm. Well despite the original attempts being started in France in the very early 19th century, the prize was offered by Emperor Napoleon III about the time of the American Civil War, the prize being collected by a chemist, Hippolyte Mège-Mouriès in 1869, the process involving adding beef tallow to skim milk and churning it like cream, which produced a product, similar in consistency to butter with at least a hint of a butter flavor, bringing the product to market in that country in the early 1870’s and shortly after making it into most of Europe and to America. In the very late 19th and early 20th century, vegetable oils were slowly being used to make this product. It was accepted fairly well in Europe, but it was not as well accepted in this country by dairy farmers and grocers, they were able to get legislation in some areas forbidding its sale and in other to prevent it from being dyed yellow (the product being white). The following in quotes is from The Grocers Encyclopedia by Artemas Ward, copyright 1911. “”OLEOMARGARINE, also called Margarine and Butterine: was invented by the French chemist, Mege Mouriez in 1871. As manufactured to-day it is generally composed of 40% to 45% beef or Oleo oil; 20% to 25% Neutral lard (from the first rendering of the leaf fat of the hog) and 10% to 30% butter, milk or cream. Vegetable oils, such as cotton-seed oil, are sometimes added. The mixture is churned at a temperature above the melting point, and then chilled and salted, worked, etc., in about the same way as butter. At the solicitation of those interested in the production and sale of butter, Congress passed a law, effective July 1, 1902, placing a tax of one-quarter of a cent a pound on uncolored Oleomargarine, and a tax of ten cents a pound on the colored product. In a great many states, manufacturers are, under severe penalties, entirely forbidden the use of coloring matter. The law also requires that all Oleomargarine shall be plainly so labeled, that it shall not be sold in substitution for butter, and that when used in hotels, boarding-houses, etc., the fact must be made known by announcements to that effect posted where they may be readily seen. It would take the fat shortages during WWI and later WII to really make this product popular in this country, the Federal tax was removed in the middle 1950’s although individual states still had restrictions till the 1960’s. Vegetable shortening is an imitation lard product made from vegetable oils, a product that came on the market just before WWI. The process called hydrogenation that makes vegetable oils solid at room temperature makes vegetable shortening (as well as vegetable oil based margarine) possible is a process where hydrogen is used with a catalyst to break the double carbon bonds that prevent the oils from being solid at room temperature, we don’t need to go into depth on this, we just need to know this is what makes it possible. The first vegetable shortenings on the market were made of cotton seed oil; later soy bean and Canola oil have been used. I hope this helps folks on choosing the proper fats and oils to use in our historical camps. The included pictures are actually depression era from the Farm Security Administration, how ever they are still pretty much spot on for what we are discussing, little had changed in 40-50 years. The first photo is a lady rendering lard outside on an open fire, the next two show a large creamery butter churn (run by electricity, earlier would be run by and over head belt powered by water or steam) and a lady wrapping butter. 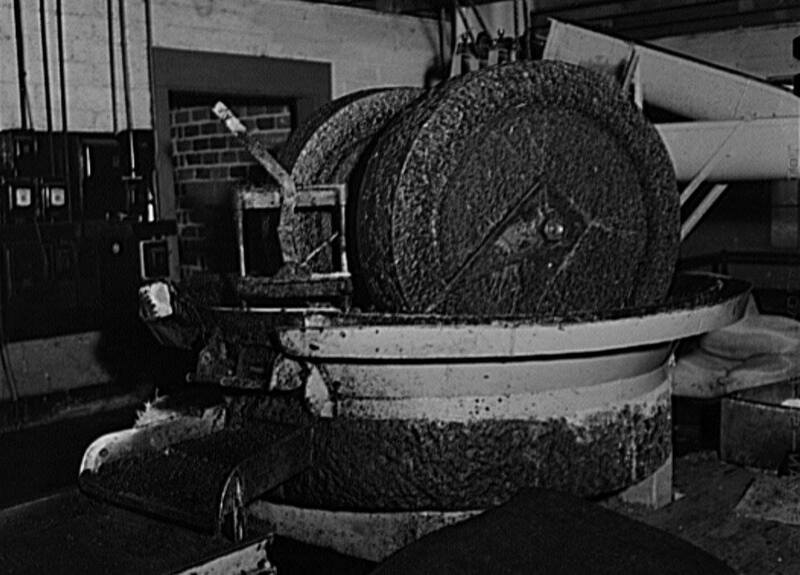 The last three show olive pressing in California, using the old world methods, olives in large bins with a wheelbarrow loaded to take them to the stone grinder, and then the press, cold pressing the crushed olives for oil, using a hydraulic ram instead of the traditional screw press.